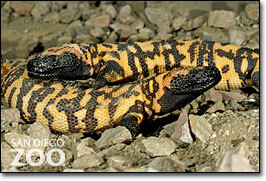 Gila Monsters exit their hibernation stage to not just find food but also find a mating partner. The male Gila Monster shows its mating dominance through intense combat with another male. These battle can last for many hours. Each male has no intentions on hurting each other, but only to win the the chance to have the nearest female. The winner finds the female by scenting his way to her by the use of his tongue. The females usually wait until the male finds her. He then approaches the female and crawls beside her. 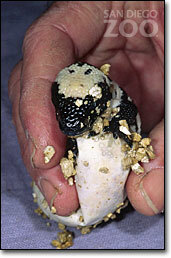 The male Gila Monster then pins the female down with his back leg, and begins to lick her skin and rub his chin against her upper body. Eventually after minutes of caressing the female, she accepts and lifts her tail, opening her vent. The male goes behind and connects his vent to hers. The male then enters his hemipenis. lizards are not hatched untilthe next spring. without any training or experience from the parents. like battling or laying the eggs.